An assignment for my Art Direction II class, I created this multimedia advertising campaign for a small town called Hell, Michigan. The assignment was to choose a city, neighborhood or town, and create a campaign based on the UNEXPECTED. We were to find out something odd about the place, discovering random facts that may draw our target audience in. Furthermore, we were to increase brand awareness, targeting a younger market, ages 25-35 through various advertising mediums, and to entice them to check out the town for a weekend, or even potentially move to. Before getting into the campaign, I wanted to give a peak into some of my ideation process. During this process, I pretty much go wild with thoughts and ideas. I try to put everything down that I think of so that I have a record of it all. A moodboard is meant to inspire designs. It's apparent where some of my inspiration came from just by taking a quick glance at my moodboard. The identity above features a devil's pitchfork creating negative space within a heart. The pitchfork spells out an "h" for hell and also spells out "m" for Michigan. Simply put, Love Hell, Michigan. This traditional billboard is saying that you'll have a "HELLUVA GOODTIME" when you visit Hell, Michigan. This traditional billboard is says that you'll have a "HELLUVA GETAWAY" when you visit Hell, Michigan. This street billboard is says that you'll have a "HELLUVA RUN" when you visit Hell, Michigan. Texting "gotohell" provides additional information regarding ad. This bus shelter is says that you'll have a "HELLUVA STORY" to tell when you visit Hell, Michigan. Texting "sureashell" provides additional information regarding ad. This bus wrap is says that you'll have a "HELLUVA RIDE" when you visit Hell, Michigan. Texting "roadtohell" provides additional information regarding ad. Those who texted in will receive a direct response text message detailing more specifics about the street billboard, bus shelter, and bus wrap. This ambient media tactic will be placed on the steps leading down into city subways. Targeting couples specifically -- when you're in love, you're in heaven. And so, "THE STAIRWAY TO HELL IS CLOSER THAN YOU THINK," implying that Hell, Michigan is close by. This interactive banner works when the user rolls his mouse pointer over the ad. The word connection will begin to connect together and then take the user to the Hell, Michigan homepage. I used the word connection because we go online to connect with other people. You'll have one "HELLUVA CONNECTION" with your lover when you go to Hell, Michigan. This is the Hell, Michigan homepage. 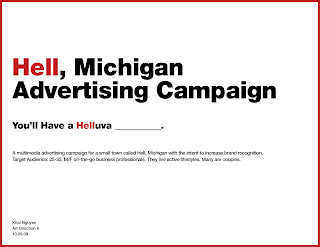 It is my hope that through the various advertising mediums that the target audience will ultimately end up visiting the Hell, Michigan website to find out further information, and plant their trip. Dentyne Campaign: "It's the Gum"